The Community Games county finals will take place Saturday 23rd & Sunday 24th in Ardattin field. There will be NO training on Friday 22nd training will take place on Tuesday and Wednesday the 19th and 20th, 6.45-7.30 u6&u8 . 7.30-8.30 u10+ on both days.. We will be focussing on relays so please try to have all children attend so that they can practice with their team. Saturday 23rd: All children are requested to participate in the Community Games Parade. It is an important part of the day and very enjoyable for the children. All Slaney Valley participants are requested to meet at our tent no later than 45am on Saturday morning to assemble for the Parade. Athletic Gear will be provided (for all athletes taking part in individual events). We will provide gear for as many others as we can for the parade also. All children can wear their own black shorts and white socks. We ask that all gear be returned on Saturday before leaving the field. It will be washed and given out on Sunday to those participating in the semi-finals/finals on Sunday. Each year a number of jerseys “go missing” so we ask that everyone co-operate with our request not to bring jerseys home on Saturday evening. Children should therefore bring their own t-shirt to change into. When the parade is finished all children must return immediately to the tent as races will start directly after the parade. No parents allowed on the running track only managers. Parents are asked to listen out for races, field events and relays and keep the children close to the tent so they do not miss their event. The normal procedure is U6’s first then U8, 10, 12 ETC. U6 and U8 will be finished by lunch time (approx 1pm) on Saturday but may have to come back Sunday. Field events will be called out so please listen. There will be a break for lunch at 1.00pm approx and the races will resume after, however some field events may take place during lunch – times to be confirmed. Please leave a contact number if your child gets through to Sunday in case of any changes in times etc. If your child is not going to participate/ for queries please contact Deirdre 087 1171881, Barry 087 9197559 or Martina 087 9960357 as soon as possible. Looking forward to seeing you all on Saturday 23rd. Please note this schedule is approximate and subject to change. There will be a charge for adults both days. Children are free. Relays for U6 and U8 (Finish by approximately 1pm) Finals on Sunday. Ball Throw 11.30am approx, Turbo Javelin 10.30. approx. & Long Jump u12 2.00pm approx., U12 Long Puck Boys 1.00pm, U14 Girls Long Puck 1.30pm. Bike races will be before lunch. After Lunch: All finals: U6, 8, 10, 12, 14, 16 including relays and middle distance races. Athletics trials for Community Games will take place for U6, 8, 10, 12, 14 & 16’s on Tuesday 22nd of May in Ardattin. Registration at 6pm. Races will begin at 6.30. Children must be 4 before the 31st of July to compete. Please note that all children wishing to take part in the trials need to register for their race on the night. If Community Games registration has not already been paid this can be done so on the night- €4 per child or €10 per family. The Community Games county finals will take place on Saturday and Sunday 23rd & 24th of June. Please do not attend the trials if you are not going to be available on these dates. If your child does not qualify in an individual event they should keep coming to athletics training as relay teams will be selected at training. Any queries to Deirdre 087 1171881, Barry 087 9197559, Martina 087 9960357. Boys & Girls U10 100m, 200m & 60m hurdles. Boys & Girls U14 100m, 800m & 80m hurdles. Boys & Girls U16 100m, 200m,1500m & 7 km Marathon. Long Jump – U 12(County Only) & U14 Boys & Girls. Long Puck Boys U12 & Girls U 14, Cycling on Grass, Shot Putt – Boys & Girls U 14, Javelin – U 14 Boys & Girls, Discus – U16 Boys & Girls,, High Jump – U 16 Boys & Girls. Our annual end of year Disco will be held on Friday the 3rd of November to acknowledge the participation of so many children in the various community games competitions during the past 12 months. This will take place at 7.00pm in Spellman Hall, Kildavin. The evening will start with the presentation of medals to the winners of our area competition in handwriting, model making and art which took place at the beginning of the year. The 27 children who travelled to Abbottstown to represent us in the National Finals will also be presented with a trophy to recognise their achievements. Following the presentations there will be a disco for all young and old – this promises to be a disco with a difference. This night is a celebration of participation in our various events and we want to see each and everyone of the children who were involved with our club during the year at our end of year party. We want to see our artists, basketballers, model makers, scribes, footballers, athletes, swimmers, cyclists, tag rugby players, chess players and those who played skittles. A raffle will be held on the night and we are asking parents to donate child centred spot prizes and to contribute generously to the raffle on the evening. Our AGM will be held on Thursday 2nd of November at 8.00pm in St Brigid’s Hall, Clonegal. A large number of children in our area have benefitted from the work of the Community Games Committee and we ask that parents show their support by attending our AGM. To finish off the year in style we are holding an end of year fun day for all the Slaney valley kids Sunday afternoon the 23nd of July. Ardattin development are officially naming the field in honor of Mim Gorman and this will take place in conjunction with the fun day. The official naming will take place at 2:30 pm and games will start at 3pm. Games that are planned will include three legged race, egg and spoon, sack race, water relays, team relays, etc. Also included will be mammy and daddy three legged race and a family relay, to name a few. All ages are welcome. Please bring spoon, patato and an old scarf or tie. Refreshments will be served in the hall. We held our handwriting area trial last Thursday evening and as always a high standard made it as competitive as ever, well done to all who took part. The top 3 go on to represent Slaney Valley at the county final, held in Ballon school, starting at 2:30pm (registration at 2pm) on Sunday the 12th of March. U10 girls: 1st Olivia Romaniec, 2nd Aoife Byrne, 3rd Abbie Grey & 4th Elizabeth Callaghan. U10 Boys 1st Johnny Sheppard, 2nd David Whitty & 3rd Niall McGrath. U12 Girls 1st Chloe Roberts, 2nd Nicole Roberts, 3rd Isabel Whitty & 4th Aoife Murphy. U12 Boys 1st Darragh Roberts, 2nd Sean Smith, 3rd Alex Callaghan & 4th Eamon Murphy. Today saw a very competitive competition with over 40 kids taking part across various age groups. The standard was very high, so regardless of results well done to everyone who took part. Most importantly everyone had a fun afternoon with their friends. The top three in each category make it through to the county final held in Askea boys school Saturday 11th March. Girls U8, 1st Ciara Fortune, 2nd Ellie Byrne Roberts, 3rd Ava Byrne & 4th Freya Coulahan. Girls u10 1st Sarah Smith, 2nd Elizabeth Callaghan, 3rd Megan Doyle & 4th Robyn Conway. Girls U12 1st Sophie Byrne, 2nd Isabel Whitty, 3rd Shanna Mae Brennan & 4th India Mernagh. Girls U14 1st Emma Byrne, 2nd Aisling Byrne, 3rd Cara Murphy & 4th Eimear Cowman. Boys U8 1st Jamie Conway, 2nd Noah Byrne, & 3rd Killian Warren. Boys U10 1st Joe Warren, 2nd James Knight, 3rd Sean Byrne & 4th David Whitty. Boys U12 1st Eamon Murphy & 2nd Alex Callaghan. We will endeavour to return the pictures through the schools, if children don’t receive pictures back please contact us. The area art final will take place on Saturday 4th March in Spellman Hall Kildavin, registration at 1.30pm and competition from 2pm-5pm. Age categories U8-U16 boys and girls. Skittles. Winners will go forward to represent Slaney Valley at the county final on Saturday 11th March in Askea Boys School, there will be a morning and an afternoon session, 9:30am and 2pm. Enquiries to Martina Carroll 087 9960357 or Deirdre Byrne 087 1171881.
finals will be held on Sunday 12th March at 2:30pm in Ballon National School. Enquiries to Martina Carroll 087 9960357. The county final will be held on Saturday 25th March in Carlow for boys and girls U9, U11 and U13. Contestants must perform the set community games routine. Interested participants please contact Deirdre Byrne by Friday 10th March on 087 1171881. County final will take place Saturday 29th April. Training will commence for U12’s and U14’s on Friday 24th March after athletic training in Ardattin. Enquiries to Valerie Coulahan 087 6837724. 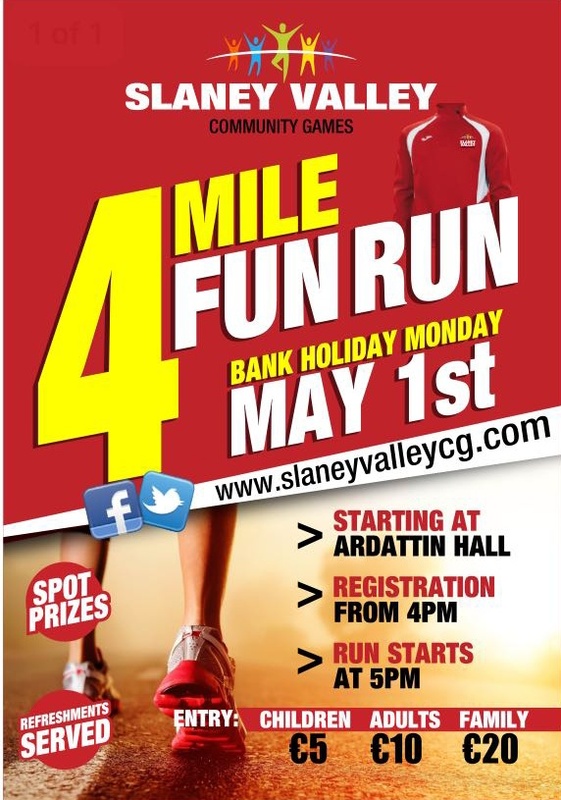 We will be holding our 4 mile fun run which is our only fundraiser of the year on Monday 1st May. Great fun for all the family. 1st Sean Byrne, 2nd David Whitty. 1st Sarah Sheppard, 2nd Shauna Doyle. 1st, 2nd, & 3rd will advance to the county final held in Ballon NS Sunday the 12th of March at 10am.